In designing the combat system, it was important to come up with one that permitted the player's management to make a real difference in the results. We ended up using Machinations, a very useful conceptual tool, to help develop a way to maximize various character attributes that can be affected by the player's management. 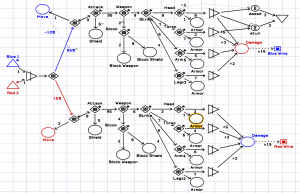 The Machinations image below is not our actual combat mechanism, it's an early and much-simplified version, but using Machinations helped us quickly experiment with different ideas and work out the various probabilities that provided credible and realistic results. We drew upon various sources, including full-contact martial arts, translated Roman documents, and an old Avalon Hill boardgame called Gladiator, to help work out what should be on the flowchart and what elements would be kicked out from it to the commentary system. The system is fundamentally built upon combat initiative, which is a probability determined by a number of attributes, most importantly the aggression rating of the gladiator. The gladiator who wins initiative will then choose to attack or perform some other action, which can involve attempting to move to a more favorable position, posturing for the crowd, jeering the opponent, or simply using the time to recover. However, the initiative-losing gladiator can still wind up attacking via the counterstrike function, although normally it will be the initiative-winner who attacks and either misses, is blocked by the opponent's shield or weapon, hits armor, or does damage to the opposing gladiator. The combat in First Sword is approximately twice as lethal as real gladiatorial combat was in ancient Rome. However, the stable owner is not necessarily entirely helpless once his fighter walks out onto the sands of the arena, as the masters of the games are notorious for their willingness to accept bribes. Although a few coins placed in the correct palm when no one is looking will never purchase victory, they will sometimes suffice to buy a defeated gladiator's life even when the crowd is baying for his blood.